The New York Jets had made a big splash in 1965 when they signed QB Joe Namath (pictured at right) to a huge contract out of Alabama. The young quarterback had shown plenty of potential during his rookie season, but both he and Head Coach Weeb Ewbank’s Jets were still a work in progress. There was a solid veteran core with flanker Don Maynard, FB Bill Mathis, G Sam DeLuca, and LB Larry Grantham, and they were joined by talented younger players such as split end George Sauer, FB Matt Snell, OT Winston Hill, G Dave Herman, and C John Schmitt on offense and DE Verlon Biggs and MLB Al Atkinson on defense. Two 1966 rookies would have an immediate impact on the offense in HB Emerson Boozer, who brought much-needed outside speed, and TE Pete Lammons. The Jets won their first game at Miami and were hosting the Houston Oilers for their home-opening contest on September 18, 1966. It seemed as though the Oilers would provide a good test, for they had already played two games and were off to a strong start. Wally Lemm had returned as head coach after a four-year hiatus with the NFL Cardinals. He first became coach during the 1961 season and led Houston to ten straight wins, including the AFL Championship game. Now he was looking to turn around a team that had endured three straight losing years. The Oilers still had 39-year-old George Blanda at quarterback and 31-year-old Charley Hennigan at flanker. But defense had dominated in the early going, most notably the line that contained 6’5”, 270-pound Pat Holmes, who had played four years in the CFL, and 6’9”, 315-pound ex-Charger Ernie Ladd at the tackle positions. Houston had soundly beaten Denver and Oakland by a combined score of 76-7 and was expected to give the Jets a tough contest. There was a big crowd of 54,681 on hand at Shea Stadium for the battle of unbeaten teams. Houston scored first on a 49-yard field goal by Blanda. But Namath, who had hyper-extended his right knee when the two teams played in the preseason, set the tone with a 67-yard touchdown pass to Sauer in which he had plenty of time in the pocket. In the second quarter, Blanda booted another field goal, from 30 yards, to narrow New York’s lead to 7-6. Late in the period the Jets put together an 85-yard drive in 11 plays. A screen pass to Matt Snell was good for a 25-yard TD to cap the series with just over two minutes remaining in the half. The Jets weren’t done scoring before halftime, however, as Al Atkinson intercepted a Blanda pass at the Houston 33 on the first play following the ensuing kickoff. Namath threw a 13-yard touchdown pass to Pete Lammons and the home team held a 21-6 lead at the intermission. Less than two minutes into the third quarter, Namath tossed another scoring pass, this time to Don Maynard for 55 yards. The Jets had broken the game open in a span of four minutes of playing time, from the second to third quarters, and they were far from done. Namath threw another scoring pass to Maynard, this time covering 37 yards, and Jim Turner added a 32-yard field goal. The Oilers didn’t penetrate deeper than the New York 30 until ten minutes into the third quarter. Blanda tossed an 11-yard touchdown pass to HB Sid Blanks, but it was a case of too-little, too-late. The Jets took a 38-13 lead into the final period. Backup QB Mike Taliaferro came in for Namath in the fourth quarter and New York scored twice more. Emerson Boozer ran for a 39-yard touchdown and Taliaferro tossed an 18-yard TD pass to TE Curley Johnson (his only catch of the year - he was better known as the team’s punter). The Jets came away with a very convincing 52-13 win. New York’s offensive line did an outstanding job of neutralizing Ladd and Holmes, and thus exposed Houston’s weakness in the defensive backfield. Defensively, another newcomer to the Jets, veteran CB Johnny Sample, had two key interceptions – the first of them stopped Houston’s deepest penetration of the first half after the Oilers had reached the New York 30. The Jets significantly outgained Houston (466 yards to 207) and had more first downs (23 to 16). The Oilers turned the ball over five times and suffered four quarterback sacks while New York didn’t turn the ball over at all and the line gave up no sacks. Joe Namath didn’t complete a high percentage of his passes, hitting on 12 of 31 attempts, but they were good for 283 yards and five touchdowns with none intercepted. 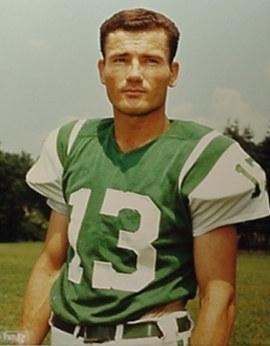 Don Maynard (pictured below) was the top receiver with 7 catches for 156 yards and two TDs. Matt Snell rushed for 67 yards on 15 carries and also caught two passes for 28 yards and a touchdown. Emerson Boozer added 49 yards on five attempts that included a TD. For the Oilers, George Blanda was successful on 15 of 34 throws for 144 yards with a touchdown and four interceptions before being relieved by Don Trull. Sid Blanks didn’t accomplish much running the ball, with three carries for six yards, but was the team’s top receiver with 7 catches for 61 yards and a TD out of the backfield. Split end Charley Frazier gained 64 yards on his three receptions. FB Charley Tolar ran for 34 yards on 10 attempts. The win over the Oilers put the Jets in first place in the Eastern Division and they were 4-0-1 before finally losing – at Houston, no less. That was the first of four straight defeats and five in six games as New York finished up at 6-6-2 and in third place. The defeat at New York was the first ever for Wally Lemm as coach of the Oilers, but it would prove to be far from the last. They lost twice more before beating the Jets at home and didn’t win again the rest of the way, ending up at the bottom of the division along with the expansion Dolphins at 3-11. Don Trull replaced George Blanda as the starting quarterback during the second half of the year and that marked the beginning of a major housecleaning that swept away such stalwarts as Blanda, Charley Hennigan, and Charley Tolar after the season. Joe Namath’s development was apparent as he led the AFL in pass attempts (471), completions (232), and yards (3379) while tossing 19 touchdown passes. However, he remained very much a developmental project as he also led the league by tossing 27 interceptions.